MANILA, Philippines – The Civil Service Commission(CSC) released results of March 18, 2018 Civil Service Exam- Paper and Pencil Test (CSE-PPT) also known as Career service examination on May 16 or within 60 days after the exam. The alphabetical list of passers for Professional and Sub-professional level for Region 5 (Bicol Region) is available on this page. 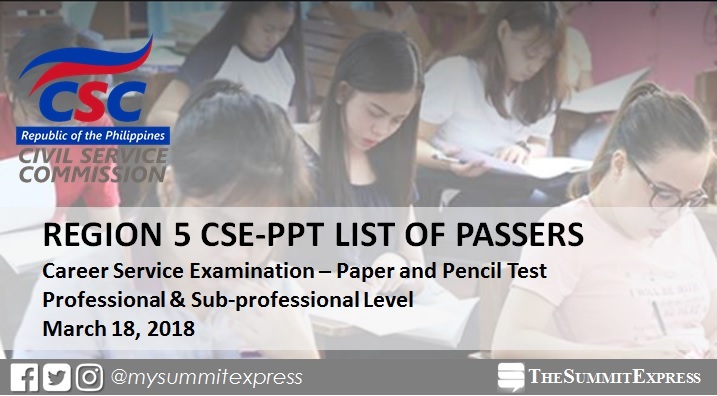 Region 5 is among the regions with considerable turnout of examinees in the CSE-PPT. While the figure of the total examinees for March 2018 CS exam is not yet available, the projection is more than 200,000 aspiring civil servants took the exam in 61 testing locations nationwide. The alphabetical list of passers per region will soon be available at the official website of CSC (csc.gov.ph). All takers may get their individual test results using the Online Civil Service Examination Result Generation System (OCSERGS), which can also be accessed through the CSC website. Note that the date of OCSERGS availability will be posted here soon but you may expect approximately 15 days after the posting of the List of Passers. The CSE-PPT is a general ability test designed to measure an individual’s preparedness to enter government service. The Professional level lasts for three hours and 10 minutes, while the Sub-professional level, for two hours and 40 minutes.